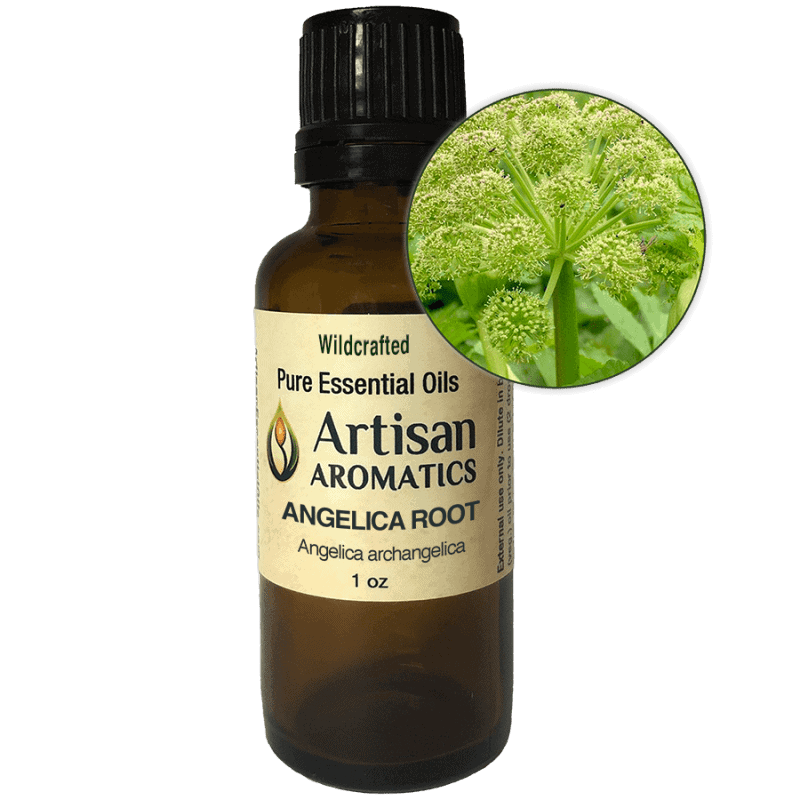 Angelica Root Essential Oil has been described as having anchoring, restorative, and strengthening properties. It’s one of our Artisan Quality essential oils and comes from an amazing small distillery in the pristine forests of Alberta, Canada, where it’s ethically wildcrafted. This exceptional Angelica Root Essential Oil is part of our artisan-created line of essential oils. It comes from an expert distiller in Canada who produces limited quantities of a few, very special, essential oils. These unique essential oils are extracted from plants that our distiller grows himself or ethically harvests from the wild. We find the aroma of our Angelica Root selection to be quite pleasant and earthy, with musky-green notes and subtle hints of spice. Note: All information on this page is provided for educational interest only. Nothing here is intended to make claims for our product “Angelica Root Essential Oil”. Your experiences with an essential oil may differ from any one else’s experiences. No information provided here is intended to be used for the diagnosis or treatment of any physical or mental illness. Please pay attention to the safety information provided below in order to insure that your experiences with this product are good ones. Angelica Root Essential Oil is said by aromatherapists to have restorative and strengthening properties that make it useful for people experiencing fatigue and stress-related problems. 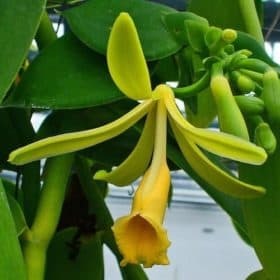 It’s also used in aromatherapy for supporting the digestive, respiratory and musculoskeletal systems; for revitalizing dull and congested skin; and, for routine menstrual issues. There are over thirty different species of Angelica but Angelica archangelica is the only one that is widely used in aromatherapy. 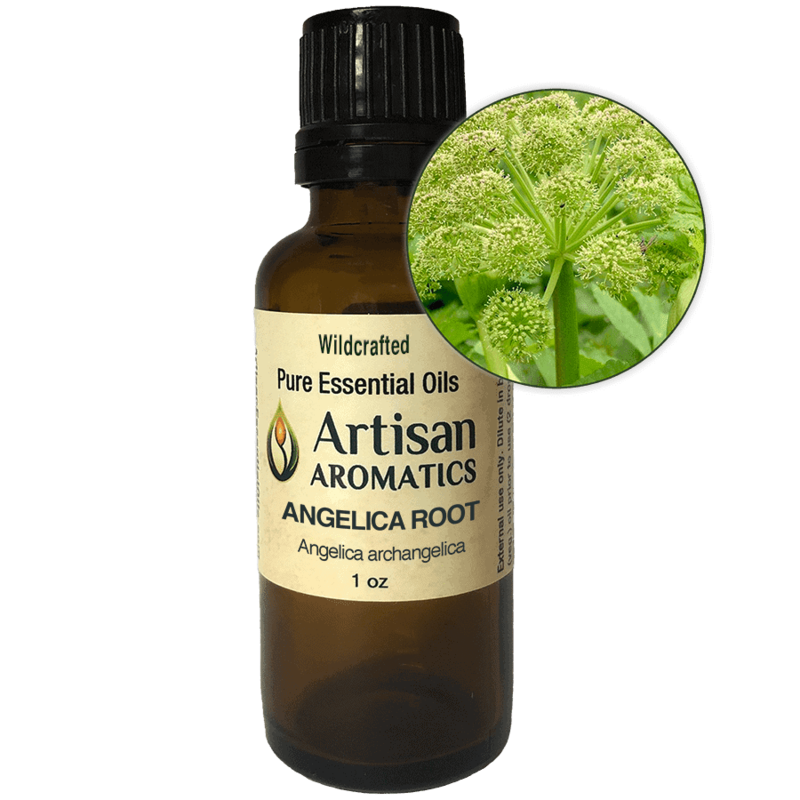 Wildcrafted Angelica Root Essential Oil is appropriate for inhalation and, by following the precautions outlined below, for topical application as well. 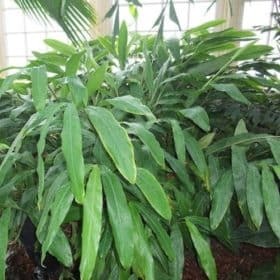 It’s also widely used in perfumery for its distinctive aroma and it provides more fixative power in these applications than does Angelica Seed essential oil. The Essential Oil of Angelica Root is phototoxic, which means that it can promote severe sun burning if used on the skin prior to exposure to the sun or tanning lamps. For this reason, it should not be applied to the skin less than 12 hours before sun exposure or use of tanning lamps unless it’s been properly diluted in vegetable oil. The maximum safe concentration for application prior to ultraviolet exposure has been reported to be 0.8%; for reference, a concentration of 0.5% equals 3 drops of essential oil in 4 teaspoons of vegetable oil and this is our recommended concentration for use. To use this essential oil on skin that will not be exposed to the sun or tanning lamps within the risky period, it should be diluted in vegetable oil or jojoba to a maximum concentration of 2.5%. To achieve this concentration, add 23 drops of Angelica Root Essential Oil to one once of vegetable oil or jojoba. 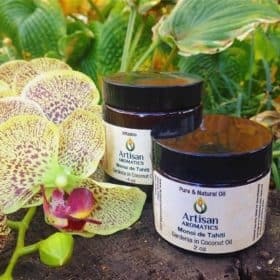 Wildcrafted Angelica root essential oil can be used in traditional steam inhalations but since this method will leave some of the oil on the skin of the face, it should not be used when sun or tanning lamp exposure will occur within 12 hours of use. To use Angelica Root Essential Oil in a bath, dilute up to 5 drops in a tablespoon of vegetable oil, jojoba oil or unscented Castile Soap and add this mixture to warm bath water; stir gently to disperse the oil. Be sure not to get the essential oil-infused bath water in your eyes; avoid exposure to sunlight or tanning lamps for at least 12 hours after bathing with this essential oil. The use of essential oils with children under16 years of age is a specialized practice not covered on this website. Safety guidelines for children are based on age and are different than those for adults so please consult a reputable aromatherapy reference book or, better yet, a properly trained professional aromatherapist, before using essential oils with children (see www.naha.org for appropriate training standards for aromatherapists and for help in locating a professional aromatherapist). Read the general “Safety Considerations” below before using Angelica Root Essential Oil. Angelica root was arguably the most important herb of the Middle Ages. 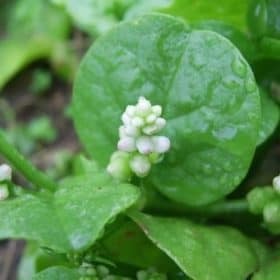 The name alone tells you that it was considered a very, very powerful plant ally in traditional European medicine and it has been highly revered throughout its history of use. Known in the Middle Ages as “Holy Spirit” or “Holy Ghost” root , angelica root was believed to have both spiritual and physical purifying and protective properties for which it was employed during the Great Plague. In addition to being used as a remedy and preventive during the Plague, Angelica root herb was also used in European folk medicine for ailments of the lungs and digestive system. 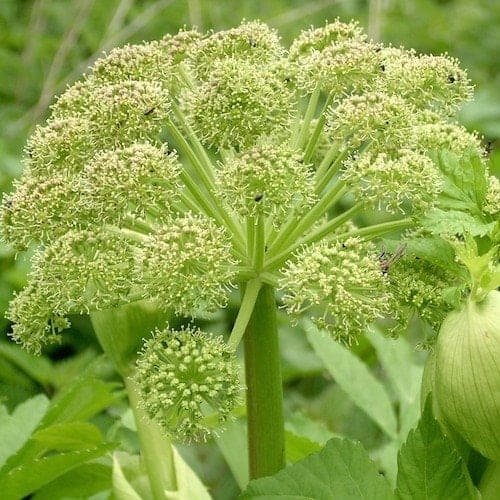 In Chinese Medicine, a number of different species of Angelica root or seed have also been used in herbal preparations for respiratory and digestive issues as well as for complaints involving the female reproductive system, such as menstrual cramps. Follow general safety guidelines for use of essential oils, as noted in the link below. Angelica root essential oil is PHOTOTOXIC and should not be applied to the skin for 12 hours before exposure to sunlight or tanning lamps unless diluted as described above. Otherwise, it is generally considered non-toxic and non-irritant IN SMALL AMOUNTS. 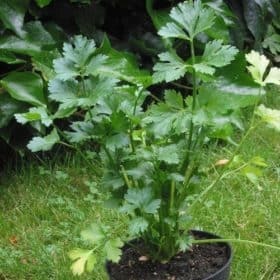 Some aromatherapists have cautioned against use of Angelica Root Essential Oil during pregnancy and in cases of diabetes. 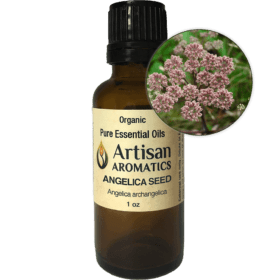 Since midwives have traditionally used angelica root as an herbal preparation to stimulate labor it seems especially wise to avoid the essential oil during pregnancy. Although we do not advise internal use of ANY essential oils except under properly qualified medical supervision, some experts have specifically cautioned against internal use of Angelica root essential oil.